The IFC_1210 is a 6U VME64X highly configurable Single Board Computer with embedded FPGA capability and VITA 42.3 XMC, PMC, VITA57 FMC slots. 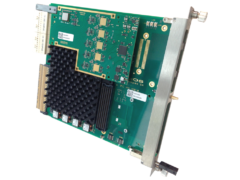 The IFC_1210 is built around a high performance switched PCI Express GEN2 architecture providing low latency and high bandwidth extension capability. 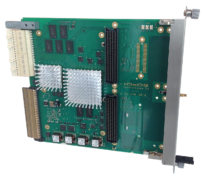 The IFC_1210 is a general purpose high-capacity FPGA platform associated with a high-performance dual core PowerPC. It is well adapted for complex real-time applications and sophisticated data acquisition. The IFC_1210 integrates the latest generation of Freescale PowerPC QorIQ processors. The P2020 provides dual-core capability running at 1.2 GHz with low power operation (< 8[W] Typ.). It is implemented with large DDR3 System Memory (up to 2 GBytes), non volatile memory NOR, NAND and multiple IO capabilities as dual Gigabit Base-T Ethernet . 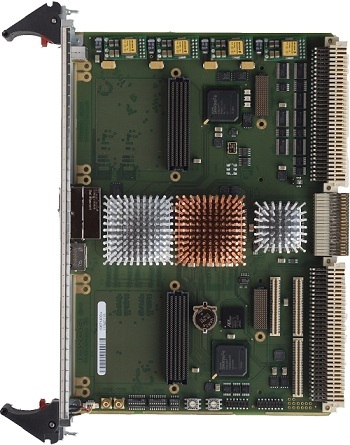 The on-board Xilinx Virtex-6T FPGA implements a high performance PCI Express centric Network on Chip (NoC) switched interconnection. This NoC architecture provides a non-blocking, controlled low-latency and highthroughput bandwidth interface between the data producer and consumer.